The article below is written by David Tolcher, who has visited Ripertoli with his family four times since 2003, and has taken some superb photographs of the local flora and fauna. We therefore asked him to write a page for the website; we hope you appreciate his enthusiasm and expertise as much as we do. The limestone hills and valleys of Northern Tuscany have long been known for the abundance of a rich fauna and flora. Ripertoli is wonderfully placed to enjoy all that the region has to offer, much of which can be seen and enjoyed within the boundaries of the estate. 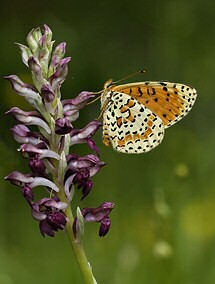 On visits to Ripertoli in May/June before the heat of the summer many of the orchids and wildflowers for which the region is famous can be found on the terraces and woodland surrounding the main house including some rarer species. One fact often overlooked is that some European butterflies migrate in huge numbers and Ripertoli holds a strategic position on the migration route from Africa to Northern Europe and this applies as much to butterflies (like the Painted Lady) as for birds. Lying by the pool counting migrating Painted Lady butterflies is a great way to conduct amateur science, peak rates can be counted in the many 100’s per hour in early June. A number of butterfly and insect species can be found all around the informal grass areas, through the woodland glades and along the rougher edges of the terraces. A week long visit can easily see a count of 60 butterfly species at the beginning of June when the last of the Spring and first of the Summer species are on the wing. As a visitor from the UK a number of rarities can be seen and it still triggers a boyish excitement when a Large Tortoiseshell is seen flying round and the ground is thick with their caterpillars, pupae can be found in many nooks and crannies. Some highlights to look out for are many species of Blue, White Admiral, Emperors, Large Tortoiseshell, several species of Hairstreak, swallowtails and some fabulous fritillaries. 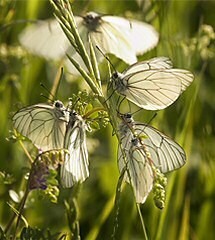 Black-veined white can be seen in huge numbers and a mating frenzy of 15-20 males around a single marooned female is a glorious sight backlit against the sun. 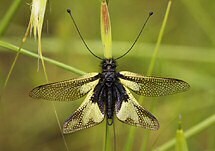 The rough grassland does host my favourite insect in abundance, the Ascaliphids that can be seen with characteristic huge club like antennae. They are cheeky chappies who when you try to look at them will always move around to the other side of the piece of grass they are on in the hope that they can’t be seen. Of the more formidable genera Hornets are perhaps the most interesting, Ripertoli’s woodland is home to the largest species of hornets which fly slowly around looking for food and often take wasps and other smaller insects. They are not often aggressive but best avoided and worth keeping doors and windows closed at night to prevent having to deal with a difficult intruder. Get up early and take a walk through the longer grasses and a large number of the insects described can be found jewelled with dew torpid on the ends of grass stems swaying gently in the breeze until the sun catches them and they are gone. There is a small and rather overgrown pond just at the top of the drive and this is home to a number of dragonfly species with male and female broad bodied chasers making for a happy half hour watching their antics as they clatter around catching insects before regularly returning to the same post to eat them. The first is the open grassland of the informal gardens where typical short limestone grassland species can be seen especially away from the regularly mown areas. Grass is interspersed with many herbs making a wonderful scent when walked on or when prostrate on ground studying a find. 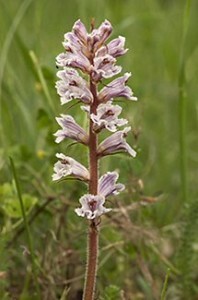 Some areas are thick with Bee orchids, Pyramidal and Fragrant orchids and species of the parasitic Broomrape family. The best find has been the rather rare Orchiaceras bergonii which is a cross between the Man and Monkey orchids. Wild gladiolus can be found in abundance in some places along with many varieties of Vetch family which are a firm favourite of the Black Veined White. The second area is a study of the rides and footpaths through the woodland surrounding Ripertoli. 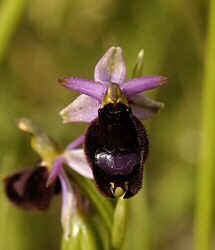 This is where numerous of the Ophrys sp. 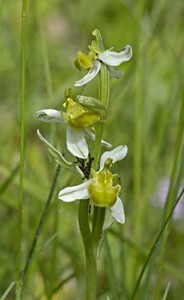 can be found in both traditional and albino forms of which my favourite is Ophrys tyrrhena. My main interest has been in the orchids and insects of Ripertoli but it would be quite wrong to end without talking about some of the other characters that you are likely to see. Love them or hate them there are snakes to be found in the wilder parts of Ripertoli and they are quite stunning to see. The vipers are likely to disappear before you see them; they have a nasty bite, although fatal no more often than bees or wasps. They are docile unless pestered or accidentally trodden on. The non-venomous species can be equally interesting, look out for grass snakes at the pond where they catch the frogs / toads that noisily announce their presence. One visit we were lucky enough to see a very large grass snake engaged in a battle with a frog that had swollen itself up to a huge size to prevent it being swallowed. Surprisingly the frog won and hobbled off to swim another day! Also look out for snakes emerging from gaps in the rocks on the terraces and basking in the sun. Italy has 19 species of snake of which you could reasonably hope (or not!) 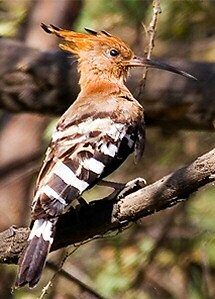 to see 2 or 3 species in a stay at Ripertoli. Other ‘herp’ interest is provided by the omnipresent lizards of which several species can be found, great fun to watch and to try to catch! I was quite unprepared for the quality of the Natural History on site although temporarily diminished by the restoration programme on the terraces it is still a wonderful experience and a treasure trove of delight for the budding Gerald Durrell. Pack your binoculars and you may be rewarded with close up views of some interesting wildlife from the comfort of the poolside chair! Ripertoli remains a dream location for the enthusiastic natural history and landscape photographer where my count of published photographs exceeds any other single site, high praise indeed.